Want to upload a new funny picture of you? Did your name change? Or maybe you have a new email address? It's just a few clicks to change any of this. We highly recommend that you upload a photo, as it makes Noko easier, quicker and more fun to use. 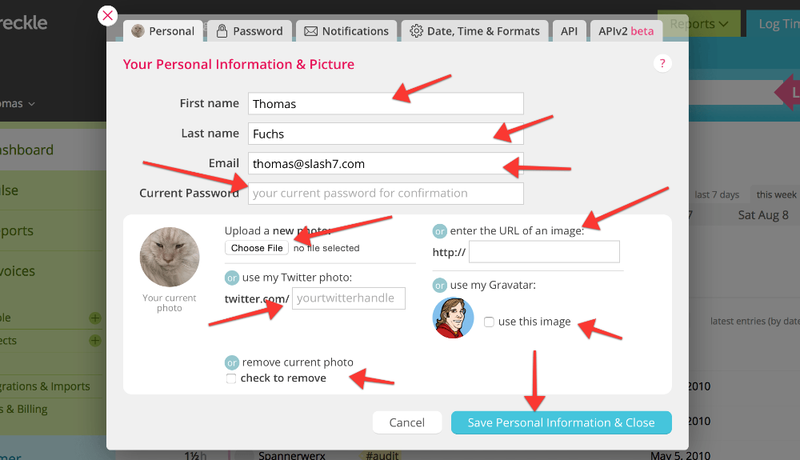 Hover over your avatar and name and click Settings & Profile. A dialog will open and will show your Personal settings. Change what you need! For your photo, Noko will suggest your Gravatar if you have one, and also lets you easily use your Twitter photo. Or just upload a photo—and don't worry if your picture isn't square, we'll cut it to the right size for you. Noko even supports animated GIFs… try it sometime to brighten up your daily time tracking routine. You can also drag and drop a picture directly onto Noko to set your picture, see below. You'll need to enter your current password to make changes. This protects you if someone just walks by your computer and tries to change your email address. Click Save Personal Information & Close. Want to set your photo with just one click? You can just drag any picture file directly onto the Noko. Noko will ask you if you're fine with how your photo looks like and then take care of the rest. If you're not happy with your current photo, but don't have a new one, just check the check to remove checkbox in the Personal tab of Settings & Profile, and confirm by clicking Save Personal Information & Close. This will remove your photo and set the default Noko photo, which is using your initials.